Dependable Graham Air Conditioning, Inc. is proud to serve the Cypress community! 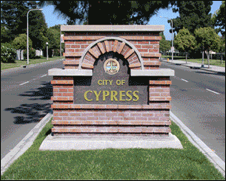 About Cypress, CA - Happy to be your hometown Heating & Air Conditioning Contractor! Cypress, a small suburban city, is located in the northern part of Orange County, California. The city was incorporated in 1956 by dairy farmers and named ″Dairy City″ in an effort to keep developers away and preserve their dairy farms. In 1957, residents voted to change the city′s name to Cypress, after the local elementary school, built in 1895. The school was named for the tresses that were built around it to protect it from the Santa Ana winds. Several large companies, such as Real Mex Restaurants, Vans, and the Mitsubishi Motor North America, are headquartered in Cypress. Among the city′s top employers are United Health Group, Cypress College and Boeing. There are several schools, public and private, located in Cypress including 2 high schools, two middle schools and 9 elementary schools. The Oxford Academy and the St. Ireaneus Parish School are also located in the city. Several famous people, including actors John Stamos and Matthew Morrison, golfer Tiger Woods, and singer-song writer Iris DeMent, have called Cypress home. Even though Cypress is a small town, it has its share of recreational activities; among them are the Central Park Community Center, The Nature Park, and Veteran′s Park. The city also has youth and adult sport leagues, as well as, a senior center. During the summer months, Cypress′s average temperatures are in the mid 70′s and the city′s average winter temperatures are in the mid to upper 50′s.